Firstly, let me say that Automata is pronounced Au-TOM-ata, not Auto-MA-ta, so please everyone, stop trying to correct my pronunciation. Yes, I used to think it was the latter too, but a magazine review told me otherwise, and when I dined there, I double checked with them. Automata theory is the study of abstract machines – machines pre-digitalisation. But we’re not here to talk about machine theory (I know bugger all about it) – all you need to know is you need to put this place on your must-do list. Automata is a cool new place in Sydney and it’s one of the three restaurants that’s opened up in the redeveloped Old Clare Hotel in Chippendale. My extremely reliable source told me, if I could only get to one of them on my last trip, this was the one. And why wouldn’t it be? It’s Clayton Wells behind the food, formerly chef at Momofuku Sieobo, one of the great Top 100 restaurants. But first, the snacks. Really good snacks. Enoki mushrooms wrapped with thin slices of Wagyu tongue with red miso and baby gem lettuce with a great sauce (but I didn’t catch what it was). The grapes were refreshing and a lovely start to the meal – sweet with savoury elements. The same concept applied to the yoghurt sorbet for dessert. I’m such a big fan of the current trend for desserts that have that savoury touch. I liked the three other courses equally. The mud crab was claw meat (the best part!) that was so naturally sweet. The white pepper broth was simply delicious and the braised pepitas had a good meaty consistency. I loved the duck hearts. My dad used to cook chicken hearts for us when I was a kid and hearts have a unique flavour and texture. They were teamed with yummy fried capers and a large wedge of red cabbage – so large that I was a little worried about the potential after-effects – but I love cabbage so I ate it all – what’s a bit of wind between friends, I say! The lightly smoked beef was a nice end to the savoury courses. 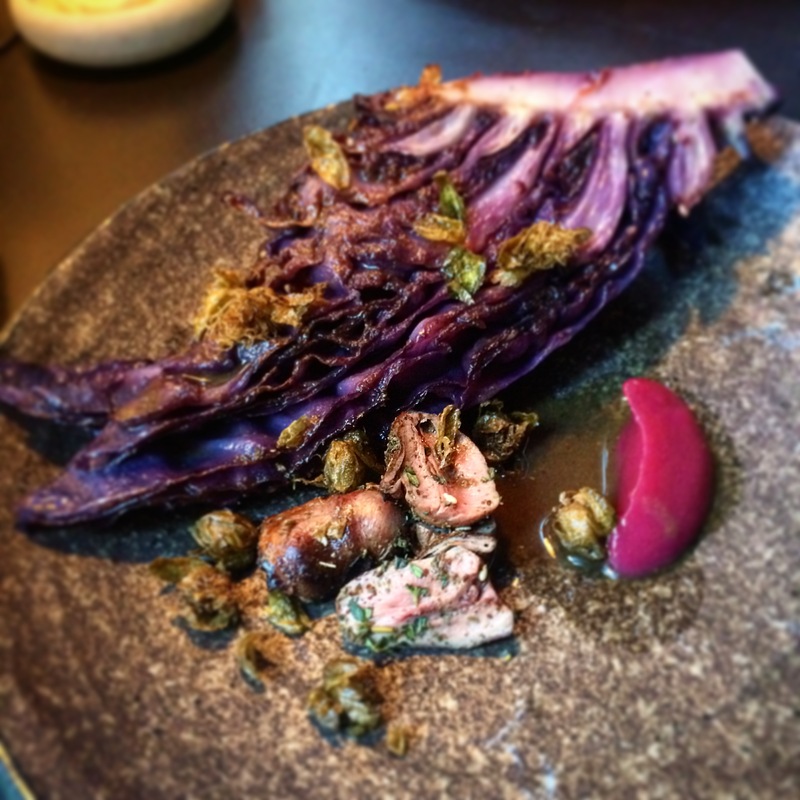 This dish had me at ‘miso’, plus wood ear fungus is one of my favourite things. It was good that we weren’t too full after the meal. The quantity was just right, and that was a bonus for me as I had an 8 course dinner at Rockpool 1989 to get through that night. Automata is a contemporary restaurant delivering exciting food that’s interesting and modern. The service was great too. I would definitely like to go back. This place is so good, I’m thinking it might make the next Top 100 list!